Getting tired of the plethora of pumpkin? Time to show fall’s other bounty, the apple, a little love—especially during National Apple Month! Apples might not have been intended for our tables, but we’re sure glad we saved them a seat. More importantly, we’re happy to have a sweeter variety to help bring this this creamy dessert to life. Cook’s Note: Make this recipe match the season by replacing the apples with an in-season fruit like strawberries, blueberries, or cranberries. Add your own special blend of spices to complement, or leave the spices out altogether. While spritzing your apples with lemon juice keeps them from browning, avoid it in this recipe! Any extra acid may keep your cream cheese from setting (yuck!). Don’t worry, the baking process will help keep your apples looking great! 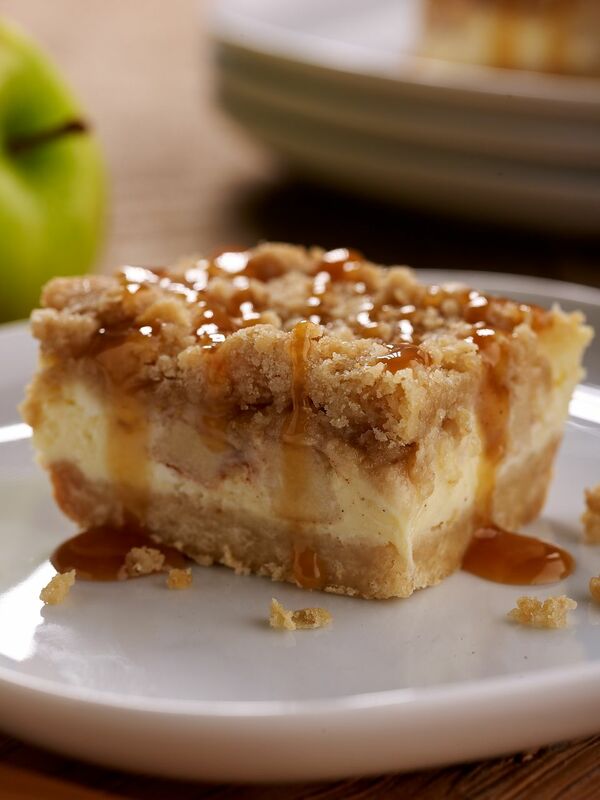 To prepare the apple cheesecake bars, first place an oven rack in the lower third of the oven and preheat to 350°F. Grease a 9" x 13" baker with cooking spray. Set aside. Toss the chopped apples, 2 Tbsp sugar, cinnamon, and nutmeg in a medium-size bowl. Set aside. Combine the flour and brown sugar a large bowl. Gently, with your fingers, add the butter and mix the dough until crumbly. Evenly press the mixture into the prepared pan and bake 25–30 minutes, or until light golden brown.